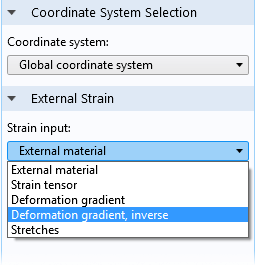 For users of the Nonlinear Structural Materials Module, COMSOL Multiphysics® version 5.3 brings new Perzyna and Chaboche viscoplastic material models and a new tutorial model that demonstrates the Lemaitre-Chaboche viscoplasticity constitutive law. 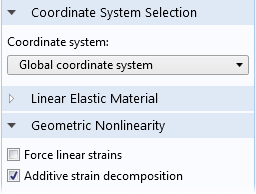 See all of the new Nonlinear Structural Materials Module features below. 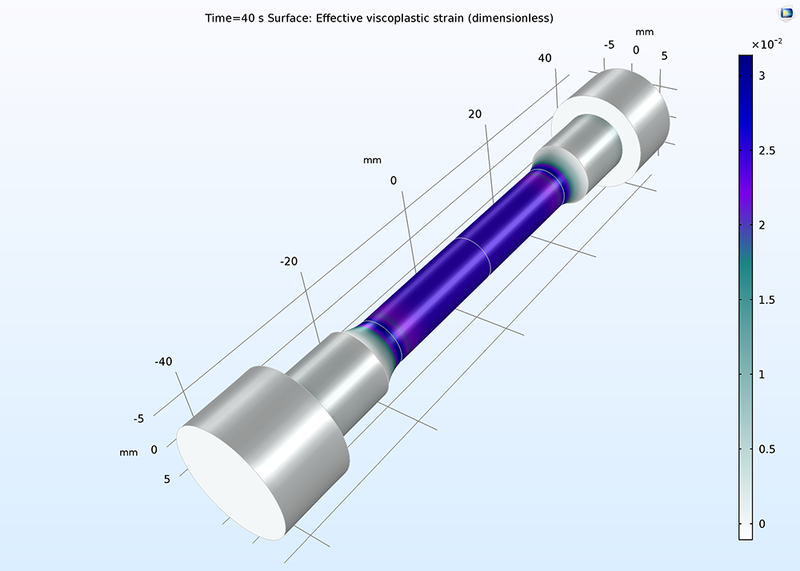 Two new viscoplastic material models have now been included: Perzyna and Chaboche. 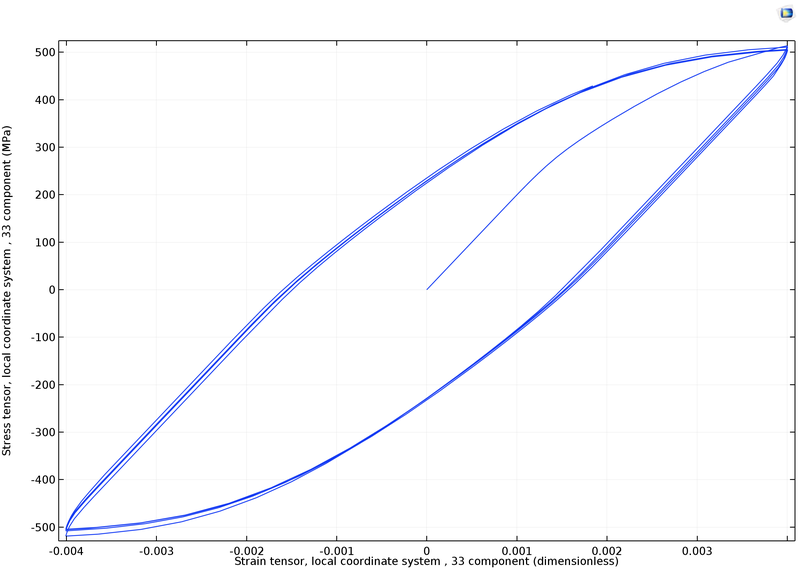 These models are suitable for cases where the yield stress has a significant dependence on the strain rate. The previously available viscoplastic material model has also been augmented such that material properties can be obtained from a Material node. Viscoplastic strains are shown in a test specimen, calculated with the new viscoplastic material model. Viscoplastic strains are shown in a test specimen, calculated with the new viscoplastic material model. The Thermal Expansion feature in the Hyperelastic Materials feature has been augmented with the option to provide orthotropic and anisotropic coefficients of thermal expansion. Similarly, you can now use orthotropic and anisotropic coefficients of hygroscopic swelling in the Hygroscopic Swelling node. Most metals and alloys undergo viscoplastic deformation at high temperatures. In case of cyclic loading, a constitutive law with both isotropic and kinematic hardening is necessary to describe effects such as ratcheting, cyclic softening/hardening, and stress relaxation. The Lemaitre-Chaboche viscoplastic model combines isotropic hardening with nonlinear kinematic hardening to model these effects. 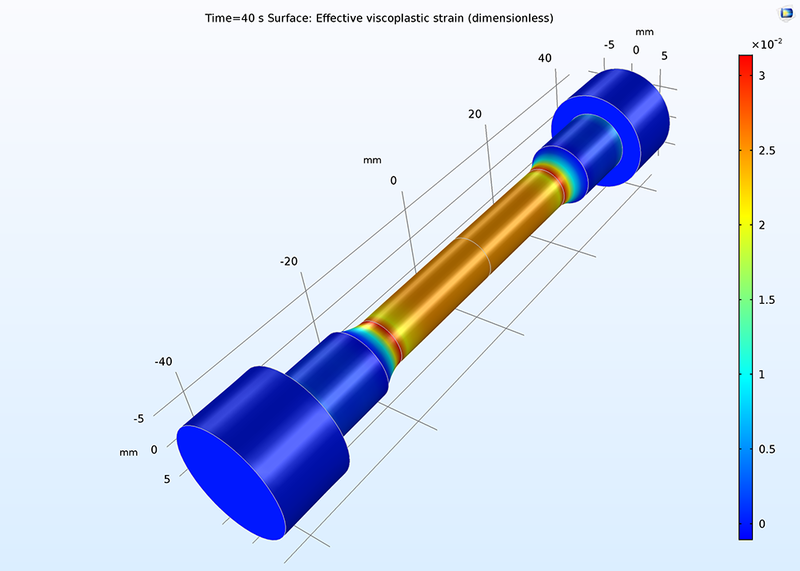 This viscoplastic model is commonly used in areas such as additive manufacturing, laser welding, laser cutting, and thermal processing of metals and alloys at high temperatures. The tutorial model demonstrates the Lemaitre-Chaboche viscoplastic constitutive law on a test specimen. Viscoplastic strains, calculated using the Lemaitre-Chaboche viscoplastic model, in a test specimen after four load cycles with a strain rate of 0.001 s-1. Viscoplastic strains, calculated using the Lemaitre-Chaboche viscoplastic model, in a test specimen after four load cycles with a strain rate of 0.001 s-1.